Moderate wounds suffered by car driver attacked by Arab terrorists with a molotov cocktail. Arab terrorists threw a molotov cocktail on Saturday night at an Israeli car near Bethlehem, adjacent to the Hussan Junction in the Gush Etzion area of Judea, leaving the driver of the car suffering from moderate wounds. After the firebomb exploded, inflicting damage on the car, a 40-year-old resident of Beitar Ilit driving the car was inflicted with first- and second-degree burns, as well as as a cut to his head, apparently from a stone that was also thrown in the attack. The wounded man, who suffers from burns, was treated by Magen David Adom (MDA) medical crews at the scene, before being evacuated to the Hadassah Ein Kerem Hospital in Jerusalem. 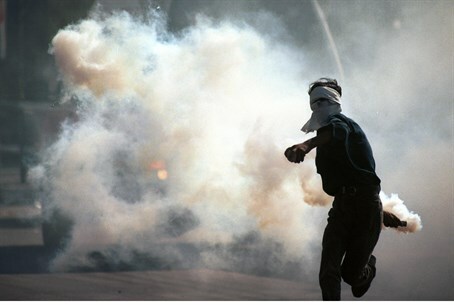 Shraga Hoffman, deputy director-general of United Hatzalah, told Arutz Sheva "when I arrived with other paramedics to the scene, we gave medical treatment to the car driver, who was suffering cuts from stones and burns from the molotov cocktail." "According to reports the driver, a resident of Beitar Illit, arrived in the area to buy something at a local store and was attacked by several young Arabs. Large IDF forces have begun a search to locate them," added Hoffman. The Hussan Junction has been a problematic area in recent weeks, with Arab terrorists commonly targeting Israeli cars and buses with stones and molotov cocktails. IDF forces are deployed in the area, and have been increased in the last two weeks since the three Israeli teens Naftali Frenkel (16), Eyal Yifrah (19) and Gilad Sha'ar (16) were abducted and murdered by Hamas terrorists on June 12, not far from the site of the firebomb attack this Saturday. While the identity of the terrorists remains unknown, the attack comes as the Al-Aqsa Martyrs' Brigades, the "military wing" of "moderate" Palestinian Authority (PA) Chairman Mahmoud Abbas's Fatah faction, declared it would be increasing terror attacks on Israel. The terror group in Judea and Samaria has declared "open war" on Israel. That call has been accompanied by a shooting attack south of Bethlehem last Sunday, after another shooting attack the Sunday before in Neve Tzuf. A wanted Fatah terrorist was killed by IDF forces near Shechem last Monday, after he refused to turn himself in and opened fire on the soldiers.